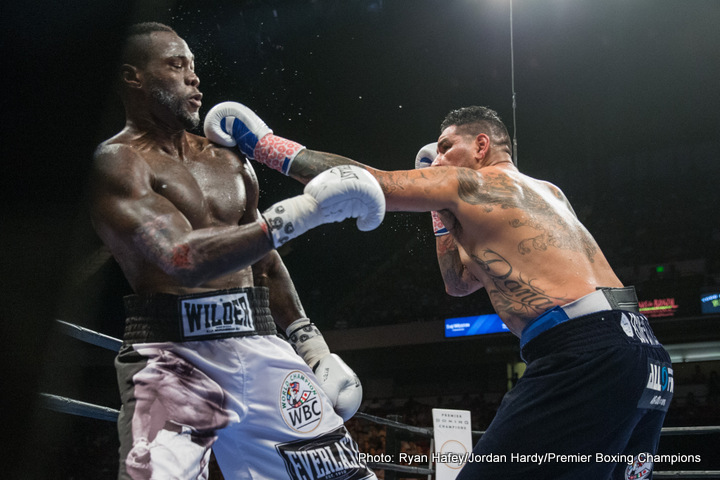 Deontay Wilder says he would have KO'd the great Joe Louis! Deontay Wilder says he would have KO’d the great Joe Louis! The old timers won’t like it one bit, and it’s probable younger fight fans will disagree with Deontay Wilder’s opinion on what would have happened had he and one of the great heavyweight champions of yesteryear got it on. Speaking with Lem Satterfield for Premier Boxing Champions, the currently sidelined WBC heavyweight king was asked which fighter in history he would have liked to have fought and how the fight would have gone. Wilder, 37-0(37) picked the immortal Joe Louis and guess what; “The Bronze Bomber” stated that he would have beaten “The Brown Bomber,” – by KO! Wilder is a good fighter, a dangerous puncher and he has heart. But Louis, a master at cutting off the ring, of wasting zero punches and of landing vicious short punches thrown on the inside, was something truly special. Again, Joe would have had to have worked his way inside Wilder’s jab, but once he did do, and once he zeroed in on a chin that has been tested by the likes of Eric Molina and (very early in Deontay’s pro career) Harold Sconiers, it would have been game over. Wilder would have fallen inside six rounds. You are here: Home / Boxing News / Deontay Wilder says he would have KO’d the great Joe Louis!